How do we know the will of God? How do I know God's will for my life? Perhaps each of us have asked this question. Our Lord said, "Man does not live by bread alone." We want a purpose for our lives. There is a well-known book in the US and Venezuela, entitled "The Purpose-Driven Life". This book deals with the question, "What is God's purpose for my life?" This book has good points and some mistakes, but its popularity is evidence of the interest of many people. Look at the words of Moses in our reading of the Old Testament (Exodus 33: 12-23): "Now therefore, if I have found grace in your eyes, I beg you to show me your way now, so that I may know you, and find you grace in your eyes; and consider that this people are your people.” Moses had seen the power of God manifested in the 10 plagues in Egypt; in the crossing of the Red Sea; in the column of cloud and the pillar of fire in which God passed in front of the people; in the thunder and lightning of Sinai. However, Moses asked God, "Show me now your way, so that I may know you". Moses, the greatest prophet of the Old Testament, had uncertainty about the future. God answered him: "Behold, stay beside me, and thou shalt stand upon the rock: and it shall come to pass, when my glory shall pass, that I will put thee in a cleft of the rock, and cover thee with my hand until it is past; I will remove my hand, and you will see my back; But my face will not be seen.” The totality of God must remain a mystery to us, because we can not bear the whole reality of God. God showed him His back, that is, part of His glory. God has also revealed something of Himself to us. We can know God as three persons in one God: Father, Son and Holy Spirit. We can not understand that, but God has revealed to us all that it is necessary to know for our salvation. So, where do we find God's will for our lives? Many people search in astrology, witchcraft, and divination because they want to know the future, especially the purpose of their lives. But, God's answer is, "Trust in me and my Word." We have an example in the Canaanite woman. "And behold, a Canaanite woman who had come out of that region cried out, saying: Lord, Son of David, have mercy on me, my daughter is gravely tormented by a demon." Remember that "Son of David" is a title of Messiah promised to Israel and the Savior promised to the world from the beginning. This foreigner trusted Jesus as Lord and Savior. "But He did not answer a word. And his disciples came and besought him, saying, Send her away, for she cries after us.” In the same way, it seems to us that God does not listen to us and does not answer us. But, we must not faint, because God has promised to listen to all the prayers in the name of Jesus. We pray in the Our Father, "Give us today the daily bread", also, "Do not let us fall into temptation". "Thy will be done on earth as it is in heaven." What this means is, in the prayer that Jesus taught his disciples, we have our model. We can put all our anxieties and worries into the hands of God. This trust is the fruit of the faith that we receive from the Holy Spirit and is our reason to pray without ceasing. Finally, the Lord answered her: "I am not sent but to the lost sheep of the house of Israel." The plan of salvation was first to proclaim the good news of the Savior to the chosen people, Israel, according to the promises of God to Abraham and the patriarchs. But the woman did not give up. 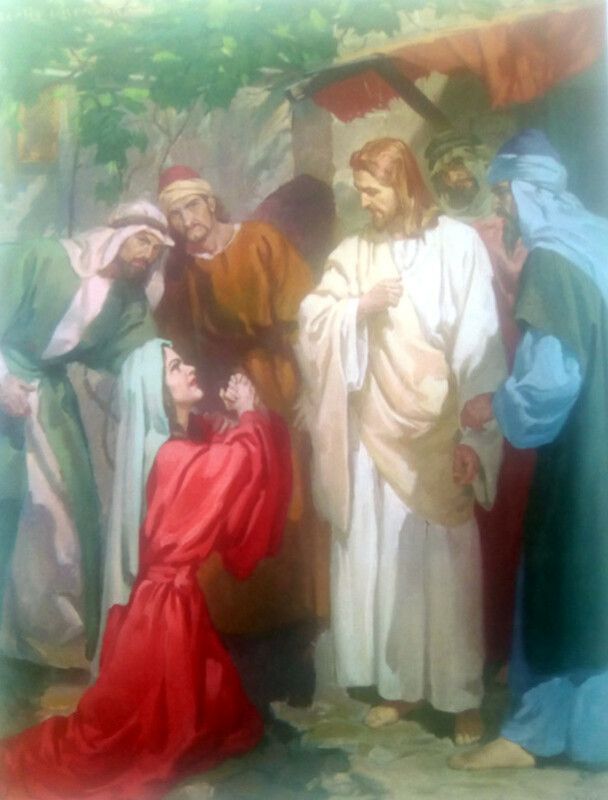 "Then she came and worshiped him, saying: Lord, help me! But he answered and said: It is not good to take the children's bread and throw it to the dogs. And she said: Yes, Lord, but the dogs eat the crumbs that fall from the table of their masters. Then Jesus answered and said to her, "O woman, great is your faith! Be done with you as you want. And her daughter was healed from that hour." However, God always shows his mercy to those who trust in Him. Therefore, the Canaanite woman is an example for us. In addition, God's plan for us is written in the Holy Scriptures. The 10 commandments, the moral law, is the universal will of God for each one of us to live as his children. Also in the Scriptures we find the gospel of the forgiveness of our sins in Jesus Christ, because none of us can perfectly fulfill the law. the peace that surpasses all understanding. Amen.